Every day, Harry, Phil, and Jim are fed sunflower seeds by the staff who care for them at the Cathedral of St. John the Divine. But one day, they decide they're sick of them. They make a break for the New York City streets in search of pizza or Chinese takeout. But everywhere they go, they're told “No peacocks!” by the restaurant owners. So they try to get an ooey, gooey, delicious meal closer to home. But how are they going to sneak into the school cafeteria and get their wings on the school's world-famous mac ‘n cheese? A little plotting, some stolen disguises, and a little help from some students, and the mission is a go! But will the peacocks get their mac 'n cheese? Or will their cover be blown so they have to fly the coop? Based on the real-life beloved bird celebrities who live at the Cathedral of St. John the Divine (who are known to run off the grounds), and brought to the page in bold, bright style, No Peacocks! is a hilarious romp and a perfect read-aloud. Robin Newman was a practicing attorney and legal editor, but she now prefers to write about witches, mice, pigs and peacocks. She lives in New York with her husband, son, goldfish, and two spoiled English Cocker Spaniels, who are extremely fond of Phil, Jim, and Harry. 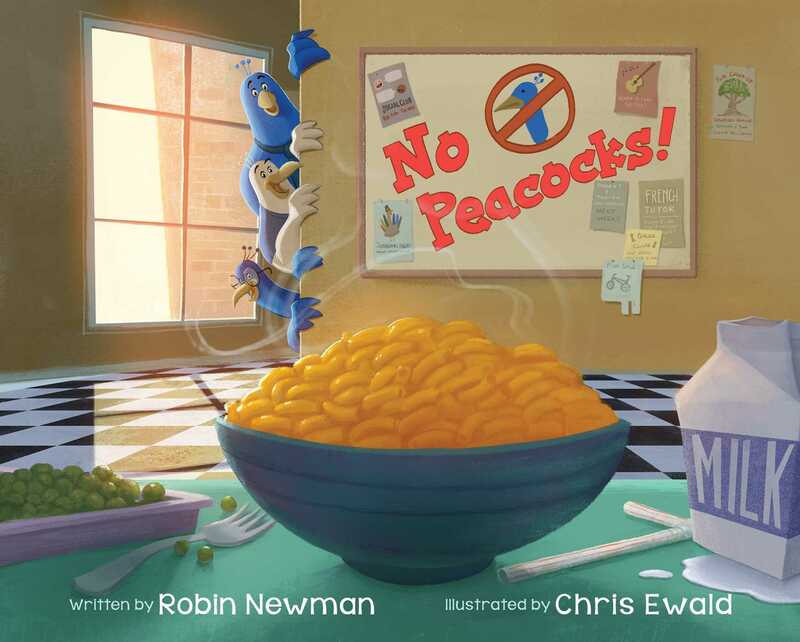 Book Cover Image (jpg): No Peacocks!